I’m not someone who responds well to gimmicks, especially when it comes to beer. 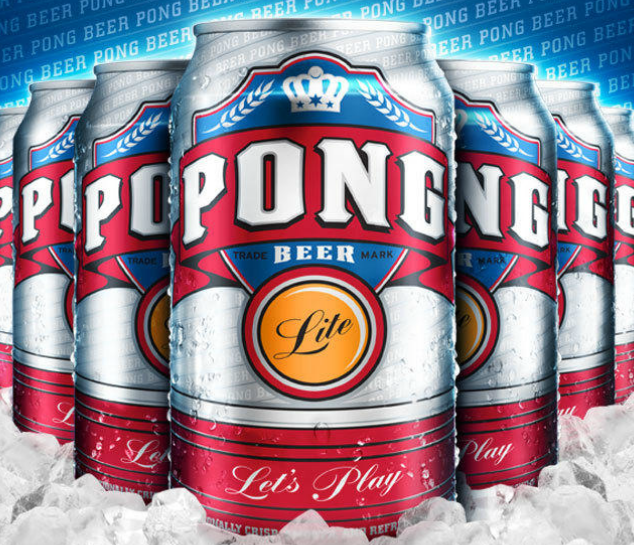 I have shuddered at chick beer, beer for the gays, dog beer, and caffeinated beer, and now we can add another painful marketing-idea-in-a-can: Pong Beer. Yes, it’s a light lager brewed specifically for putting into red solo cups and throwing balls at. God help us all. According to the sales tear sheet posted on the Dallas Observer, every 30 pack comes with two ping pong balls, and the “RELOAD 22” bundle includes two 30 packs of beer, 16 Solo cups and four ping pong balls, so time-strapped college kids “will no longer need to go to multiple stores to get everything they need to play.” The goal here is obviously to simplify beer-pong-supply shopping, leaving college kids extra time to study and become better students. Or not. 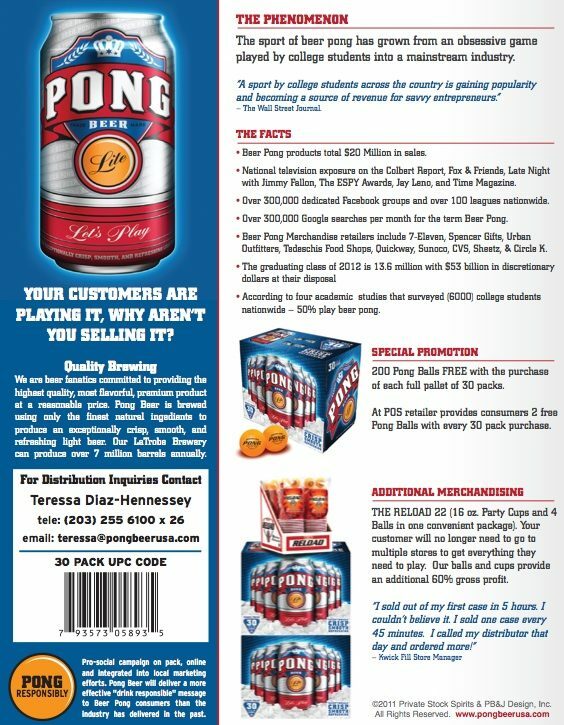 The tear sheet goes onto to boast “Our balls and cups provide an extra 60% gross profit” for the retailer. That sounds more like it. This is wrong on many levels. First up, America doesn’t need another average light beer, and by most accounts, that’s what that is. Second, while the median age of college students has risen as people head back to school during the Great Recession, the typical college student still doesn’t reach the drinking age until junior or senior year, which makes the fact that Pong Beer is aimed at college kids slightly distasteful, in a Joe Camel kind of way. Finally, I’ve whined here in the past that many beer pong competitions don’t even use beer in the glasses – they use water – making this whole concept of a beer for playing beer pong with even dumber. Oh, and did I mention I hate gimmick beers? I can’t wait until I can gleefully write a follow up post about how this stuff has tanked, as we all know that day is coming. Hopefully sooner rather than later. I am set to interview these filmmakers who did an entire documentary on beer pong. (They have a new film out about high school football.) I may have to ask them about this. Cool, Zac. Beer pong is an interesting phenomenon, especially as I imagine its popularity and codification as a “sport” have much to do with today’s heightened web-driven social connectivity, and a film about it could be cool. But this beer is not. This is a “Where’s the Beef” t-shirt, or a knock-off Crocs – an exploitation of a fad. Whoa! That was more corporate speak than I can stand in one day. I may have to take a nap. And when the fad is done I’ll be looking forward to being able to buy really cheap slug bait! Right now I use sugar, water and expoired yeast, but this may end up being cheaper–too bad Big Lots or Ollies’s can’t sell beer (LOL). I just hope you have frat slugs, because the nerdy ones will stay clear of this swill! I played whiskey pong once. Sounded like a better idea than it was. I imagine that would be a low scoring affair. Are we sure that isn’t just another iteration of Natty Light? I mean, really, isn’t that “the” beer pong beer after all? Mildly amusing in a very trailer park sort of way but, on a more serious note, its this kind of pure low brow swill marketing crap that makes it that much more important for the craft beer “movement” to better educate everyone. These are the kinds of gimmicky marketing stunts that end up painting all beer drinkers as aspiring underage binge-happy idiots. God, Sam Calgione, Greg Koch and the B&WB help us! Well, it is brewed by “Private Stock Spirits,” which leads me to believe that this beer is exceedingly rare. I’ll bet beer pong enthusiasts line up around the block to grab a case on the rare occasions that the brewery releases a batch. They probably even make a little festival out of it and sell tickets to ensure everyone is taken care of. Better than Pork Dong day. Tell me about it. How much pork dong can one guy eat! There’s a rhyme involving a woodchuck to be made. Not sure if I could make $$$ from the beer scene while making it a little bit worse. Dunno, Jim, people make money off human trafficking left and right throughout the world. Don’t have such a, you know, conscience about the world you live in. Take advantage of everyone around you – it’s the way of the world. Isn’t that basically what the guy who invented Ameriocan style Budweoser did? I think so – guess it’s a pretty sound business model! That last one was s’posed to be in response to Haas’s comment about thinking of it first. True, but it’s also BEER!!! Haas, you’re logic is impeccable! Sounds to me like somebody found an old warehouse full of Coors, repackaged it with ping-pong balls and Solos, and figured if nobody who would notice would be buying it anyway. Ah, capitalism!